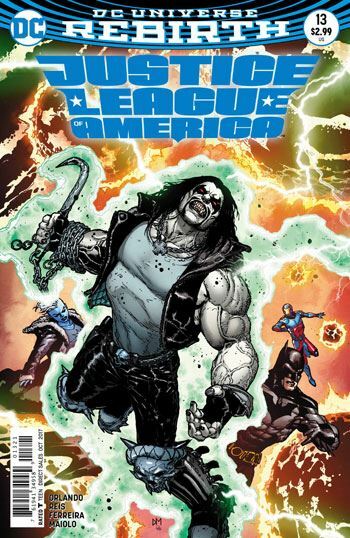 Justice League of America 13 continues the hunt for Ray Palmer in the Microverse, a storyline that began in the previous issue. This is very much a middle chapter, fairly low on action, long on development of the nature of the Microverse. This is always a difficult sort of chapter to pull off, but Orlando succeeds admirably. A big part of the credit has to go to Ivan Reis and Julio Ferreira as well, for rendering such a visually captivating world. We learn a fair bit about the Microverse, which is far more extensive and varied than many comic book battlegrounds. Orlando presents us, and the team, with two main characters for the League to work with. Each of them is in conflict with the other one, though, and only one of them can be telling the truth, and a true ally for the team. 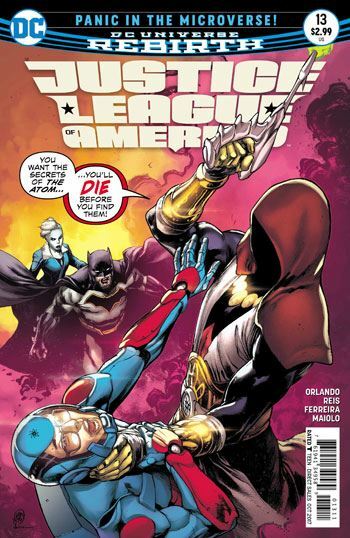 The story puts the Atom front and centre, but gives some strong moments to Killer Frost and Batman. It’s really only Lobo who seems along for the ride in this issue, but I don’t mind having him take a back seat. Lobo is such a strong character he often tends to overwhelm the others. Black Canary and the Ray stay back on Earth, and have a scene that sets up what will likely be the next story arc. They briefly discuss the Ray’s personal issues. That’s certainly nothing new for this book. The pairing of Ray and Black Canary did bring to mind that brief period in the 90s when different incarnations of the two characters had a fling. Whether or not the scene was intended to do that, it did make me reflect on how much things have changed, and improved, in the way both of them are now written.